The fact is, 60% of the adult body is made up of water and it’s up to us to keep those levels topped up with at least eight glasses of fluid each day. Our guide explains some of the best ways to keep hydrated. Water is wonderful, but despite it keeping our skin glowing, our digestive systems happy and our metabolism functioning in the way that it should, some of us simply aren't getting enough. Worried you're not drinking enough? When you’re busy it’s so easy to forget to drink enough water. You might even find plain water a bit on the boring side and crave more exciting ways to hydrate your body. We’ve therefore created this handy guide to help you get creative with your water and ensure your body is hydrated every minute of every day. Keeping a glass or bottle of water by your bedside is one of the best ways to avoid dehydration during the night, but don’t forget it’s there once your alarm chimes in the morning. Before your feet even leave the warmth of your duvet, grab your glass and drink what’s left to get your day off to a great start! Regular sips of water throughout the day can soon add up, but what if you’re a bit forgetful or leave your water bottle in your bag or locker? Investing in some really smart water bottle technology could help. The smart water bottle from Hidrate Spark® connects to your phone via Bluetooth to help you to track your water intake. It even glows when it’s time to get sipping again! Don’t fancy spending lots of money on a water bottle? The team here at Vitabiotics have a really nifty DIY water bottle hack. Just grab a bottle and draw lines down the side at equal distances. Challenge yourself to reach the next line within the next hour. To add a competitive angle, why not get your whole office involved? If you find water a bit bland and don’t particularly enjoy drinking it on its own, there are plenty of different ways to brighten up your bottle. Slice up some lemon, lime, orange and grapefruit and drop them into your water bottle. Top up with ice cold water and let the infusion happen naturally. Top tip: Using smaller slices of fruit will encourage the water to take on flavour more quickly than larger slices. Use a vegetable peeler to make long, thin slices of cucumber. Add these to your water bottle, along with a small bunch of mint for an infused water worthy of any high-end spa. Top tip: Roll your mint between the palms of your hands to help release the natural essential oils contained within. It’ll make the water taste extra refreshing! For an infused water that tastes more like a cocktail, try adding a sprig of rosemary and some pink grapefruit to your water. Not only will you love the herby addition of the rosemary, you’ll be treated to a boost of vitamin C from the grapefruit. Top tip: Pushed for time? Why not make some infused ice? Pack an ice cube tray with some fruit (small, soft fruits like blueberries and raspberries work brilliantly here) and fill with water. 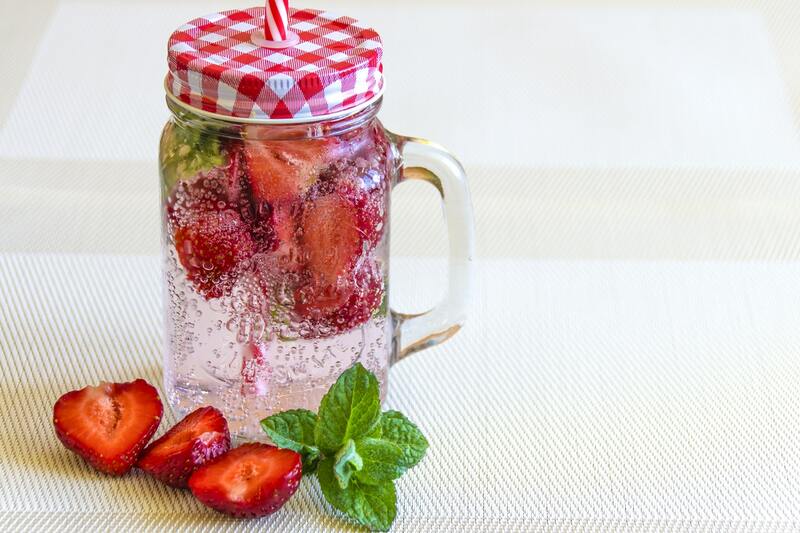 Pop a few cubes into your water bottle and enjoy the taste of fruit throughout the day. Believe it or not, purified water does actually taste better, especially if you live in an area with very hard or very soft tap water. Investing in a great water filter can make water from the tap much more appetising (and cheaper than buying bottled mineral water every time). Top tip: Keep a jug of purified water in the fridge, so every time you open the door you will remember to pour yourself a chilled glass of H2O. It shouldn’t make sense, but it really does work. Drinking your water through a straw will allow you to drink more in a shorter period of time. Try it for yourself and you might be surprised just how much you drink in a day. 6. Did you know that you can eat your water? Water-rich fruits and vegetables are another brilliant way of upping your overall water intake. Watermelon (the clue is in the name) is made up of 92% water by weight and when blended up with ice makes for a tasty drink indeed. The same applies to oranges and tomatoes (approximately 87% and 85% water respectively!). Top tip: Slice up a watermelon and keep it in an airtight container to grab when you’re feeling a bit parched! If you’re the type of person who needs a strong cup of coffee before facing the world each day, then you’re not alone! Later in the day, however, why not replace every other hot drink you’d normally have with a tall, cool glass of refreshing water? We all like to let our hair down every now and again and it’s possible alcoholic beverages play a part in this! Waking up with a hangover is often more trouble than it’s worth. This is because alcohol is a diuretic and the hangover is partly your body suffering from dehydration. For every drink you take, ask the bartender for at least half a pint of water. This will not only prevent dehydration but also slow down the absorption of alcohol. If you’re a fan of the fizz and enjoy the taste of fizzy soft drinks, consider swapping to a sparkling mineral or soda water. This way, you won't miss the fizzy sensation but you’ll be avoiding all of the chemicals, sugar and acids are often found in fizzy drinks. 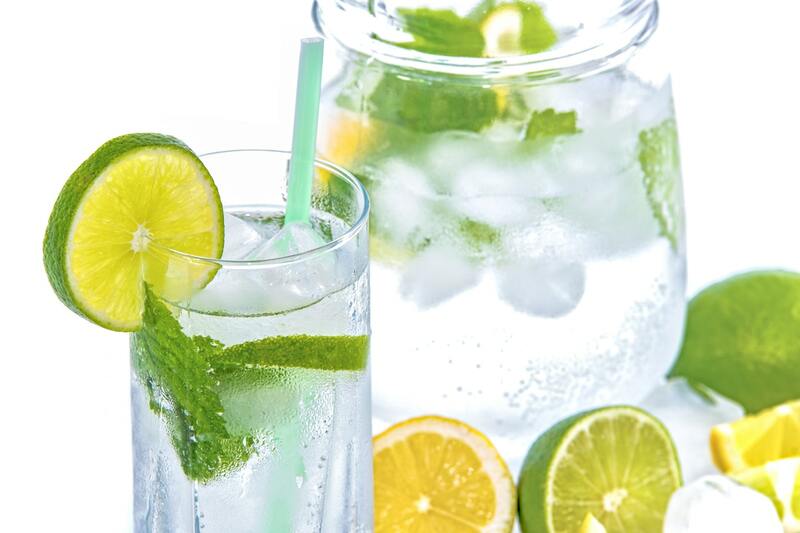 Top tip: A squeeze or slice of lemon added to soda water could be a great alternative to sugar-packed lemonade. There is an app for everything these days. There’s even an app that will help you track your daily water intake. Waterlogged is a completely free app that logs how much water you drink and sends you reminders if you’re not staying on track. Drinking more water could change your life for the better. Learn to love the taste of water and you’ll soon find yourself more hydrated, thinking clearer and sleeping better. Every single sip is good for you. Remember, don’t forget to take our Wellness Score quiz and find out exactly how you can maintain your overall health and wellbeing! Let us know your score in the comments below.